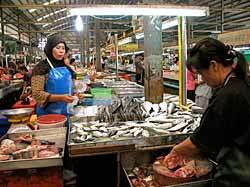 The morning market in Krabi is lively and bustling. 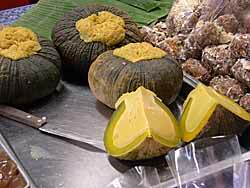 It seems that every town and village in Thailand has at least a couple local markets: there will be at least one morning market and another separate market with different vendors in the evening. 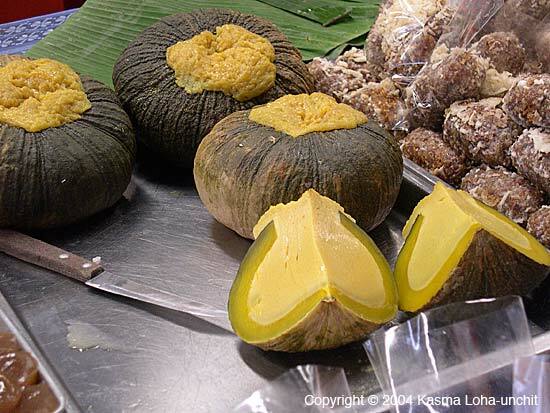 Wherever we travel in Thailand, on our own or on Kasma’s small-group tours to Thailand, we visit as many markets as possible. 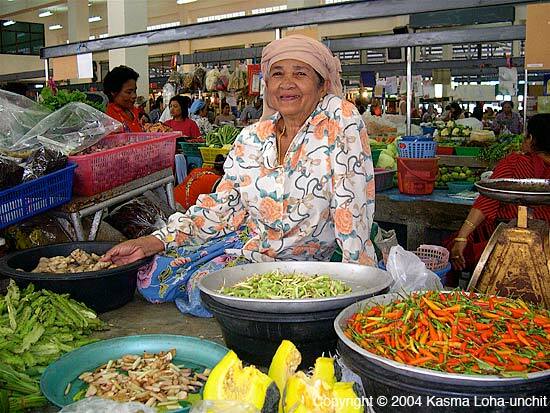 The Krabi morning market is definitely on our “to visit” list. 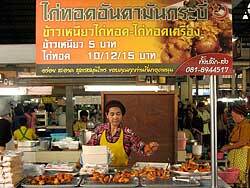 It must be ten years or more that the morning market in Krabi moved to a new location. Before it was a completely outdoor market; when it moved to its new location, it acquired raised stalls under a large pavilion-type roof. At first I was worried that it would not be as interesting. Thankfully, I worried for nothing. This is an early morning market located on Thanon Si Sawat, in-between Thanon Maharat and Thanon Utarakit. I’d get there around 7:00 a.m. or so, because even by 8:00 a.m. or so, you may miss out on some of the best treats. 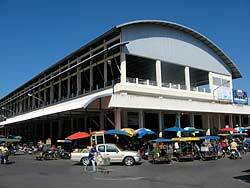 This large covered market is spread out over two areas. As you approach the market by walking down from the main highway, starting on the stalls to the right you’ll find the prepared food. To the left, towards the street, is an area that mainly has Thai kanom or snacks: we nearly always start out by heading over to the Grilled Coconut-rice Hotcakes (Kanom Krok) vendor to get a basket to eat with breakfast. 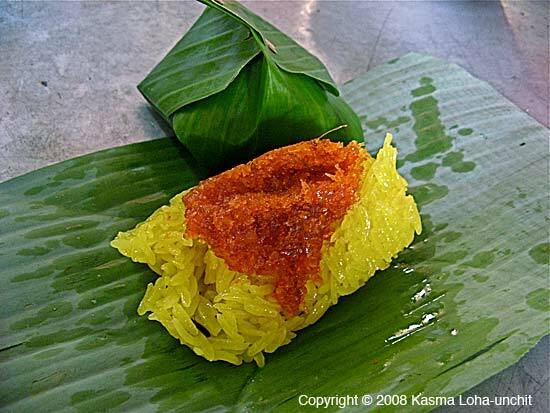 There are numerous other delicious looking treats, from Coconut Custard (Sangkaya) to banana-wrapped sticky rice with various flavorings. 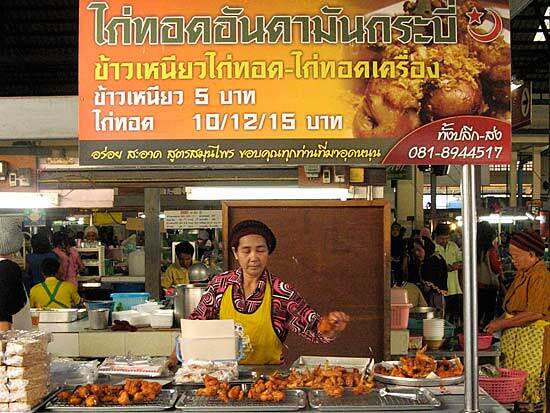 Although there’s a lot of good-looking dishes, from curries to kanom jeen, we nearly always get fried chicken from a vendor on the outermost aisle: it’s opposite the building that sells pork and beef. 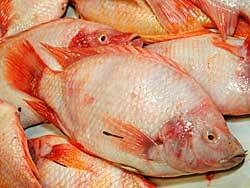 Often there’s a bit of a line and you may need to wait for more to be fried. It is worth the wait. I usually get a couple of thigh pieces and Kasma often opts for the wings: more delicious crunchy bits to enjoy. 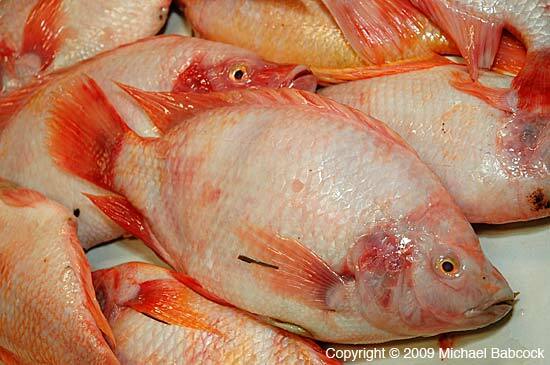 After eating, we’ll browse the rest of the market, talking with vendors and taking pictures. As with most markets we visit, Kasma brings pictures of vendors from the previous visit so the vendors are often quite happy to have us take their photographs. 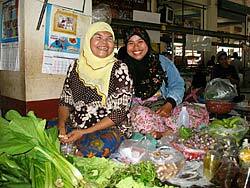 At this market , a large number (probably the majority) of the vendors are Muslim women. And the vast majority of them return a smile with a smile. Near the section with the sweets is an extensive section of (very) fresh seafood. It can be a bit slippery under foot from all the water. Browsing through this section I usually regret that we don’t have access to a kitchen so we can get one of the super-fresh looking fish to take home and fry up crispy with a chilli-tamarind sauce. Towards the front of the market you can find all kinds of fruits. Over to the left-side building are mostly vegetables of all kinds. In the back of the market you’ll find staples such as fish-sauce, rice and coconut milk. 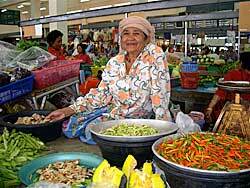 When I think of this market, what I most remember are the smiling vendors. The best reason for traveling to Thailand remains the Thai people; all of the beauty and color from the sights is just an added bonus. This entry was posted on Saturday, February 27th, 2010 at 12:05 am	and is filed under Markets, Travel. You can follow any responses to this entry through the RSS 2.0 feed. You can leave a response, or trackback from your own site. Krabi morning market is really great place for buying delicious food and specially for fired check and fresh fish and vegetable. Krabi, Thailand is a best place for island lover and for family vacations.